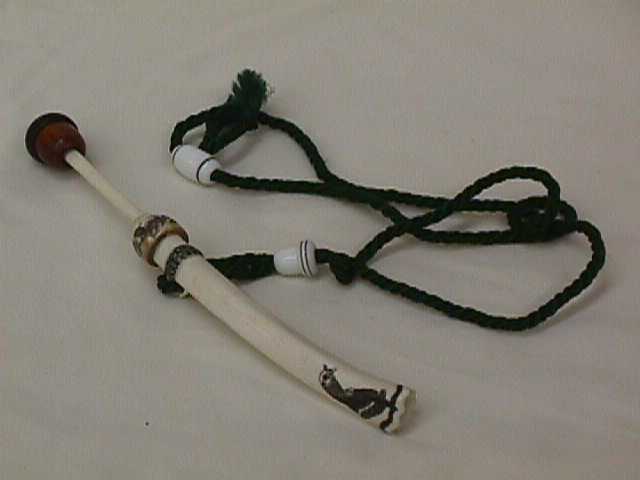 The two bone call is a suction yelper type call suitable for yelps, clucks, kee kee runs, and cutting. It can be made to call very softly or very loud. It's my personal favorite of the wingbone types. It doesn't make as deep a sound as the 3 bone. The 3 bone call has a nice mellow sound, but not quite as versatile as to range as a 2 bone. This call can be decorated more extensively than the 2 bone. High or low pitches depending on customer's desires. In 2005 my wingbone call won the Jordan Award and Best of Show in the working division at the N.W.T. F. National Call Contest. Both of these calls are custom made to the customer's specification. For more information or prices, please call or e-mail us.